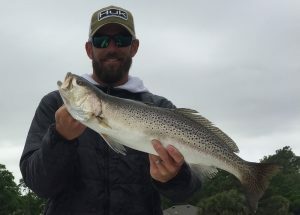 The big speckled trout bite has officially turned on right now in Destin. 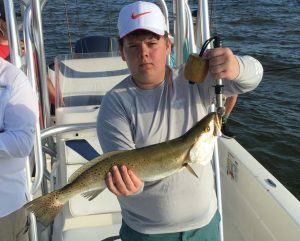 We are catching multiple three to six pound trout every charter, typically limiting out on our trout over 20″ and then releasing the rest. As much as I love catching redfish, mainly because I love the sound of the drag, I absolutely love seeing big trout jump completely out of the water and explode the top with massive head shakes. We are catching most of our trout right now on the flats but quite a few are also coming from deeper docks in the back bay areas of Destin. We are using a combination of live bait and topwater lures, topwater being the more exciting bite while the live bait is producing the most fish. 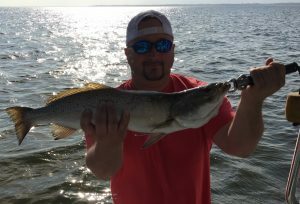 With the bite as good as it is right now there is a lot of fun to be had in Destin on the water.